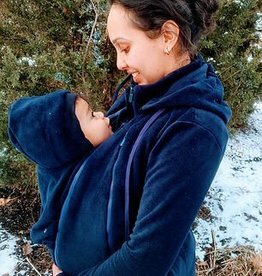 Classic Whole Mama Fleece keeps you and your baby or toddler cozy all year long. Use with any baby carrier. Best in temperatures of 50-65F or colder with layering. New and improved Whole Mama Fleece keeps you and your baby or toddler cozy all year long. Use with any baby carrier. Best in temperatures of 50-65F or colder with layering.